Because it's Still All About Deal Flow! plus discounts for the Breakout Conferences, the Monday NextGen Lunch, and an invite for our female pros to the Women's Networking Hour. We'll have the numerous tables in our bullpen areas for those who wish to catch a few more people throughout the one-on-one meeting sessions. Capital Connection Cocktails builds on the highly popular Monday night by expanding the wine table hosting and opening it up to all professsionals. 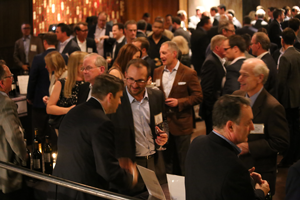 Feature your firm at this classic event: All DealSource firms with a reserved table can host a wine/beer/drink tasting table at no extra registration fee. There is no additional cost except the drinks you wish to provide. Previous hosts have typically brought a case or two of wine. This is where you'll connect with the rest of the deal community, get leads from key advisors and continue to build your brand and network. This celebration will be held @ Millennium Park and feature Investment Bankers, Lenders & Investors to a national audience. Breakfast @ The Swissotel Chicago on Tuesday morning. All DealSource participants, many of the Capital Connection Cocktail professionals and most of the Breakout Conference attendees will gather for this 50th Anniversary Luncheon Celebration. And, Substantial Discounts to the Breakout Conferences occurring after lunch. Our 9th Healthcare M&A Conference, or the Global M&A Conference. There also is a New Corporate Bootcamp which will be limited to C-Level executives and sponsors. Member / Non-member Investment Bank DealSource fees range from $350 to $1150 with all add-ons. Please click the register button to explore your selections. Make Sure You Firm is Featured Because, for all Deal Makers, It's Still All About Deal Flow.